Plus, now through August 15, you’ll earn a $15-off coupon valid on your purchase of $15 or more at JCPenney when you purchase $100 in JCPenney gift cards. *Bonus cash will be valid 8/16/14 – 9/01/14. Make sure you purchase the $100 in JCPenney gift cards by August 15. Then use the gift cards with the coupons when you shop. By purchasing the gift cards prior to shopping you’ll earn an extra $15 to spend on top of the coupons that you might have received in the mail. If you wait until August 16 to use the $10-off $10 coupon you will also be able to use the $15-off $15 coupon. However, you may need to split your transaction to use both coupons. The $20-off $50 and $10-off $25 must be used by August 9. If you’re not a member of JCPenny Rewards you might want head over here. You can earn $10 to use at JCPenney for every $100 spent. Plus, occasionally they will have double rewards, which will allow you to earn $10 for every $50 spent! 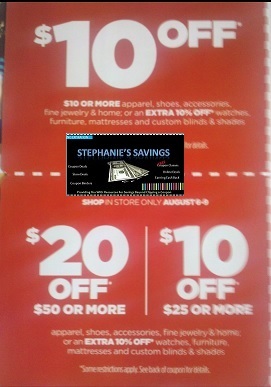 Note: the above promotions are not part of the JCPenny Rewards program. They are coupons that are mailed to select address randomly. ← P&G Coupons You Can Print!